The increasing use of aluminum-silicon light alloys in the automotive, motorcycle and aeronautical industries, and of exotic or composite materials consisting of carbon, glass and Kevlar fibers, chiefly in the aerospace industry, has given a major boost to cutting material research and development, leading to the ever more frequent adoption of Polycrystalline Diamond (PCD) cutting tools. This cutting material is produced by sintering mixtures of synthetic diamond powders and appropriately treated powders that act as a binder. Using PCD Polycrystalline Diamond cutting edges makes possible to achieve long tool service lives, as tools retain their integrity at operating temperatures of up to approximately 800°C. Long tool life is a good reason to opt for PCD in light alloy and composite material machining applications. To effectively assess the cost/benefits ratio that can be achieved by using PCD cutting tools, it is advisable to take a close look at the machining costs involved in producing surface finishes better than Ra 0,5. Low roughness values are essential in order to obtain tolerances that make it possible to produce the highly accurate part dimensions demanded in applications that put a premium on reliability, or in order to improve lubrication by reducing friction between parts subject to wear. 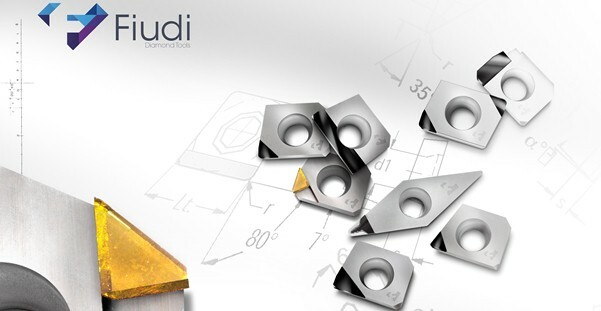 Using PCD cutting tools permits a significant increase in cutting speed, thus lowering machining costs while at the same time achieving extremely good surface finish. Cubic Boron Nitride (CBN) is produced by treating the main component of the mixture, Hexagonal Boron Nitride crystals, at high temperature and pressure. Hexagonal Boron Nitride is converted directly into Cubic Boron Nitride at pressures of approximately 18 Gpa and temperatures between 1730° and 2000°. Adding boron oxide to the original mixture can lower the required temperature and pressure. This process makes it possible to produce a material, CBN, with Vickers Hv hardnesses around 40/50 Gpa, in forms and dimensions that are sufficiently precise to be cut and shaped for use as the cutting edges on hard metal inserts. The different “concentrations”, in terms of percentage content of cubic nitrides, and the size of the grains making up the powder, contribute to determining the relationship between cutting edge wear resistance and toughness. Cubic Boron Nitride (CBN) is a superabrasive cutting material second only to natural diamond in hardness. Compared to natural diamond, however, it has better chemical stability in applications involving high operating temperatures as a result of the pressures and friction exerted by workpiece material on the cutting edge’s surface. Longer cutting edge life as a function of cutting speed and lower machining time often justify spending more for cutting tools in order to achieve a lower cost per piece produced, while if higher productivity is achieved, higher costs can be tolerated provided that resources are correctly managed.